A male cyclist was taken to hospital with life-threatening injuries overnight Wednesday after being struck by the driver of a tractor-trailer, Peel paramedics say. The cyclist, in his 20s, was southbound on Dixie Road near Derry Road in Mississauga when he was hit shortly before 3:20 a.m.
Paramedics rushed the cyclist to the trauma centre at Sunnybrook Hospital with significant injuries. 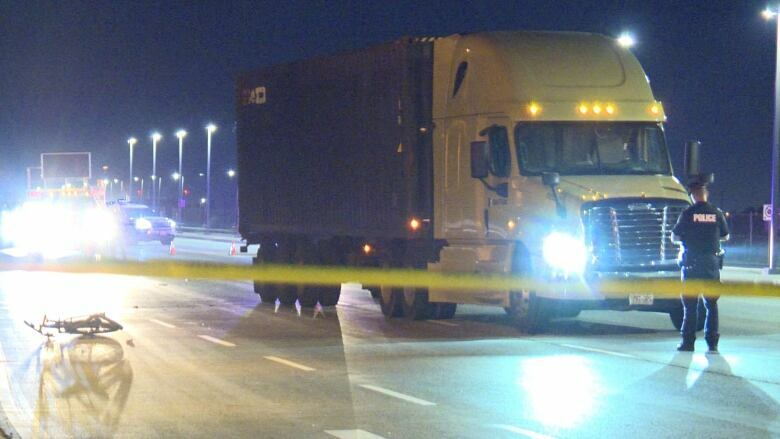 The truck driver remained at the scene and is co-operating with investigators, according to Peel police. The force's Major Collision Bureau has taken over the investigation. Dixie Road is closed to traffic between Director Gate and Mid-Way Boulevard.